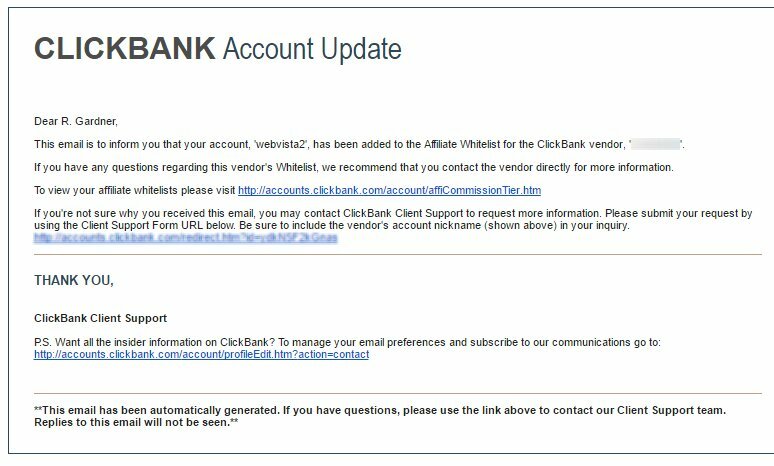 A few days ago, I received a Clickbank Whitelist invitation with the subject line, “You've Been Added to a ClickBank Affiliate Whitelist”. Receiving a Clickbank whitelist invitation to promote a Clickbank vendor's product means that the vendor doesn't allow just anyone to promote their product. They've searched through successful affiliates on Clickbank and deliberately picked those whom they want to promote their products. If you haven't been whitelisted for that product, you can structure a typical Clickbank affiliate link, but won't be paid for sales that you make. 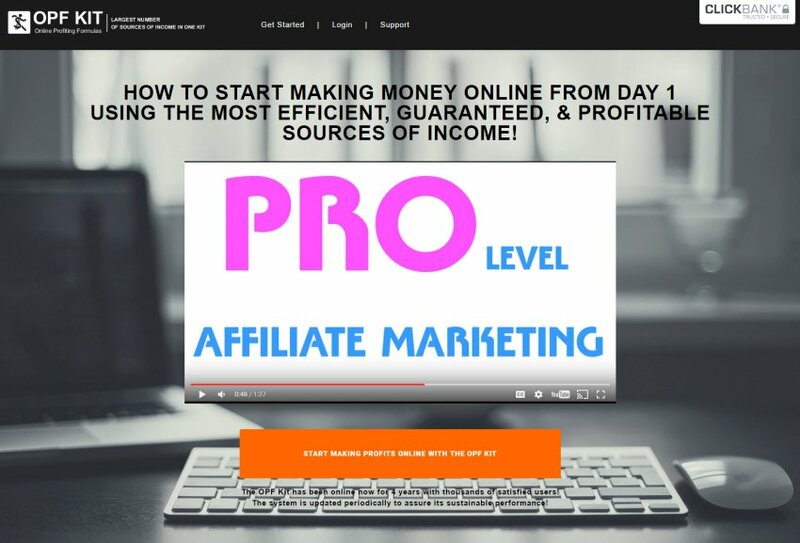 What I found particularly interesting is that the invitation I received was sent to my English, Spanish and German Clickbank accounts for the Super Affiliate Handbook, although the product being promoted is only available in English. Hmm…weird. I clicked through the link attached to the email to check the product offering out. Arriving at a very well-designed, informative landing page, I actually read the entire thing. But one very big problem stopped me from even considering to promote their product. Can you, as an affiliate marketer, spot what that ‘one very big problem was'? If so, leave a comment below and tell me what you think the problem is with this Clickbank product. By the way, although I reviewed the Clickbank vendor's landing page, I did not buy the product, and therefore this is not an endorsement for or a criticism against the actual product being sold on the page. It could be quite useful, I don't know. You'll have to do your own research. Granted, the one good thing is that they need abide by Clickbank's refund policy rules, so if you buy it and don't like it, you can get a full refund within 8 weeks of purchase. Is it that outrageous claim of making money on the first day? I can’t open the website/landing page. It keeps coming up as an unsecured connection. Yet, if you check the affiliates link, it mentions nothing about the white listing requirement. In fact, it states: “You will receive a flat end 75% commission for every single sale you make!” It also offers two alternate affiliate networks you can sell through. This does not exactly instill confidence. You are very good at this… Thanks… I have been enjoying trying to find what you may not like about it.. I did do one thing though…. I listened to the whole video and could be a buyer… ahahaha.. but will wait until your answer Friday…. At the bottom of their sales page they have “leakage”… a clickbank link to another product. The link uses someone else’s affiliate link. So you will not get credit. Yup, this gets my vote. “youcan make $300 from day 1” Income claim and misspelling. The web page states the product shows you guaranteed sources of income. I don’t know of any legitimate training program that would make such a claim. I think the first warning sign that stuck out to me was the fact that you mentioned you got whitelisted on some of your other websites which were blatantly irrelevant- this en-masse approach automatically gets my spam senses tingling. As an aside, I’m a Chartered Accountant who’s recently started a blog on personal finance and entrepreneurship. I would love to get into affiliate marketing but am having a hard time thinking of the kinds of products/services I should be promoting. I was wondering if you have anything updated or any similar posts for my niche? Any advice on my website and how I could go about breaking into my affiliate marketing niche would be greatly appreciated.